Heat oven to 350°F. To make chips, cut each tortilla into 8 wedges; place in large bowl. Drizzle with melted margarine; sprinkle with cinnamon-sugar blend. Toss to coat. Spread tortilla wedges in single layer on ungreased cookie sheet. Bake at 350°F. for 8 to 12 minutes or until crisp and golden brown. Meanwhile, spoon "salsa" and "sour cream" into small serving bowls. To serve, pile warm chips on serving platter. Drizzle chips with warm "not-cho cheese sauce." 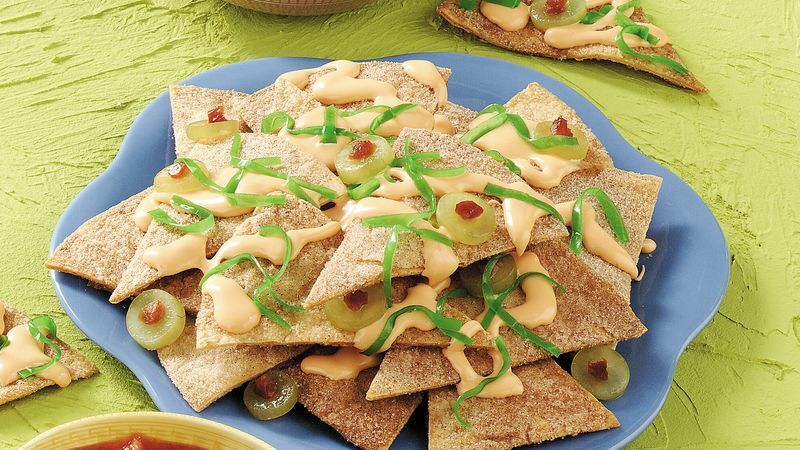 Top with "lettuce" and "olives" as desired.